Aunty Pam was born and raised on Oahu and lives in the ahupuaʻa of Kuliʻouʻou. She holds a Bachelor’s Degree in Merchandising from University of Hawaii Manoa. Pam is currently employed as a project specialist for the Hawaii Coral Reef Initiative Research Program and the Pacific International Training Desk at the University of Hawai’i Manoa. She is an active member of the ʻEwa Limu Project and volunteers with several community groups. 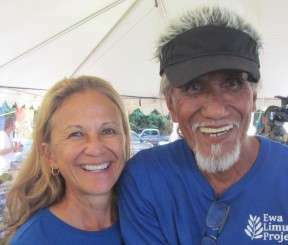 M Pam and her husband Dennis were mentored by Uncle Henry Chang Wo and grateful for his guidance and sharing of his pono wisdom.